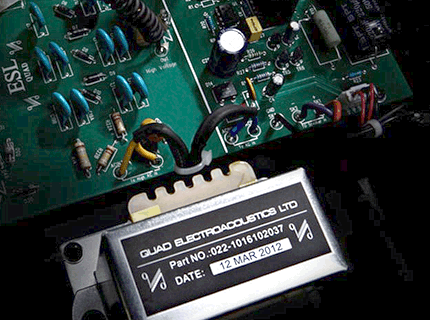 Quad is the leading designer and manufacturer of full-range electrostatic loudspeakers. 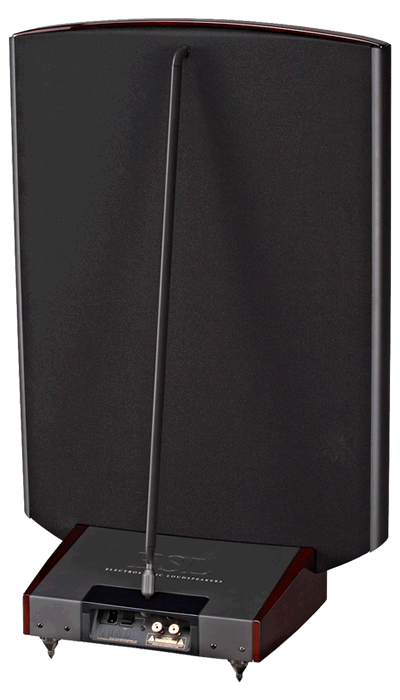 Quad ESL electrostatic speakers are used more by professional musicians and master recording technicians than any others because they have the greatest fidelity to compare live with recorded sound with very little sonic signature of their own, and because they can listened to for hours without fatigue. 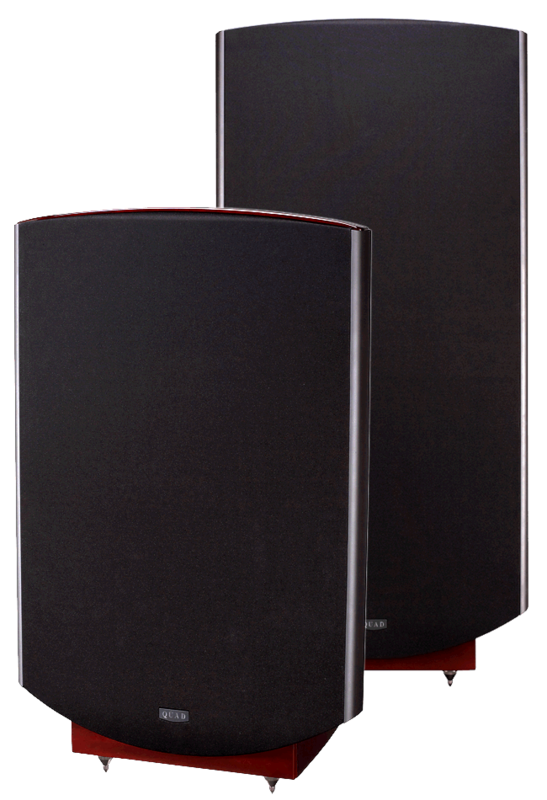 Quad ESL speakers achieve more of the potential of electrostatic design and are regarded by many as some of the finest loudspeakers available. The latest ESL 2812 and ESL 2912 supersede the previous ESL 2805 and 2905 models and successfully evolve Quad's legendary design. Many audio experts would agree that electrostatic speakers embody good sound reproduction principles and in many areas surpass what can be achieved with conventional moving coil multi-driver box loudspeakers. The biggest challenges are getting extended bass response of sufficient output, and good dispersion characteristics. These are harder to achieve in practice and many designs are either impracticably large or hybrid compromises. First a few things to bear in mind before buying electrostatic speakers. The sound output is far more dependent on the level of charge held by the membrane than on the voltage level of the input signal. Once the membrane is fully charged it just needs a little trickle current to keep it topped up. It takes time, however, for the membrane surface to acquire an evenly distributed charge, and although the power supplies work harder at first, and the speakers can be played after charging for say an hour, they really need a few days of charging to become fully evenly charged. Playing music - low levels at first, while they are charging helps speed up this process. This is why at kemela to give a proper demonstration of Quad ELS speakers we require advance notice. You should not buy Quad ELS speakers if you can not position the speakers at least 2-3ft from the rear wall (4-5ft is better). Using noise reducing power cables or a good power filter will improve performance as the speakers act as large antennas. You will need space for the keeping the large shipping boxes. Please contact kemela to learn about the special steps we take over delivery when you buy Quad ELS speakers from us and after sales support. They actually play quite loudly, sometimes much more than you realize until you get up and move somewhere else in the room and find you need to turn them down. At times the sound is quite startling in its breadth, width and subtle detailing. They are actually very effective in the surround sound mode, adding an almost uncanny sense of 3D depth (very unexpected). Classical, new age and Jazz sound awesome on the speakers. The Quads are marvelous sound producers. I am blessed to owned them. They are and more than, what I expected. Incredible. Some material sounds like I have on head phones. After a break-in period I was a very happy camper. Incidentally, I bought them unheard, on the strength of my thirty plus years with Quad 63s. Same wonderful midrange, but a huge, accurate soundstage � and bass! So, I very much recommend this option. I hope TAS will soon offer their opinion on these terrific new Quads. The Quads are awesome. Really shine on everything I play. The concept of a lightweight membrane with a conductive coating moving under electrostatic attraction between high voltage "grids" was explored early on in the development of loudspeakers by Rice and Kellog at Bell Labs in the 1920s. A midrange/treble electrostatic speaker was made commercially available by Janszen in 1952 that was sold paired with separate woofers. In 1955, Peter Walker, founder of Quad (originally the Acoustical Manufacturing Company) wrote three 'Wireless World' articles which covered much of electrostatic speaker theory in considerable depth and detail. The legendary Quad 57 full-range electrostatic speaker designed by Walker and Williamson appeared a few years later and enthusiasts continue to keep these speakers running today. The -6dB low frequency response of the latest models is 37Hz for the Quad ESL 2812, and 32Hz for Quad ESL 2912, with the corresponding high frequency response of 21kHz for both without any losses of a crossover network. There is a seamless quality to the sound that only a pure electrostatic can provide and both models can be accommodated in most living rooms. The total mass of the membrane in the Quad ESL is many times less than the mass of the lightest tweeter diaphragm and motor assembly. Because there is so little mass, the rise time is very fast - less than a millisecond and there is no oscillating damping decay associated with the down. Quad ESLs are the only speakers in the world shown to reproduce a square wave. This is the reference to which all other speakers are compared. The bass driver plus electrostatic mid/high freq range hybrid designs can not approach this benchmark. Fundamentally the limiting factor with all loudspeakers is the non-linearity of air itself. Due to the large area of ESL panels, variations of local area pressure (due to room nodes and anti-nodes) has less effect than on small drivers so in general ESLs can produce a more even bass response in a room once their dipole radiating characteristics have been taken into account. 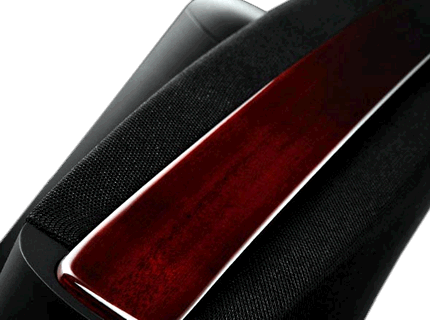 Hybrid designs introduce coloration, crossover artifacts, compression and distortion in the bass frequencies. Second harmonic distortion makes a big contribution to the total acoustical output in speakers with conventional cone drivers. The nature of harmonic distortion in electronic and electromechanical systems such as loudspeakers is different to natural harmonics because they are produced as a result of non-linearity whereas in musical instruments they are always perfectly symmetrical and related to a fundamental resonance. From the data presented in Sound Stage Network's NRC loudspeaker measurements it will be evident that the percentage of distortion relative to the signal increases with signal level. Tested at 90dB @ 2M, levels of 3-10% are typical between 50Hz and 100Hz. Raising the test level 5dB to 95dB increases distortion to over 20% in many cases. Both Quad ESLs have distortion of less than 1% above 50Hz and 0.5% above 100Hz at a 100dB @ 1M test level (the NRC measurements only go up to 95dB). This is a huge and significant difference. Cabinet vibrating surfaces make a large contribution to the total acoustical output (loudspeaker cone + cabinet surfaces + ports) of conventional box speakers and are the biggest source of coloration. As the box increases in size, the contribution increases. Worse still the cabinet contribution is stored and released over time smearing the output from the driver. The greater mass the more the storage and the more difficult to stop vibration once set in motion. There is neither box nor baffle in the Quad ESL. Problem eliminated. Only the Quad ELS has a series of annular electrodes that work in conjunction with delay lines to create a virtual point source for the midrange and treble frequencies. The two extra bass panels in the Quad ESL 2812 and four extra in the Quad ESL 2912 convert the response into more into a line array which has a beneficial effect for the radiated power response in the bass frequencies. A virtual point source improves imaging and makes for a larger sweet spot than a vertical line array which is very sensitive in the horizontal axis. The Quad ELS 2812 and 2912 strike the right balance between sensitivity and maximum output - all essentially determined by the spacing of the membrane from the stator. A bigger gap would allow more output but reduce sensitivity. The Quads have a sensitivity equivalent to 86dB and a maximum output of 2N/m2 at 2 meters which is equivalent to 100dB. The quantity of bass output is limited by the magnitude of polarizing voltage that can be used before air reaches it's own saturation voltage. Measurements in at orchestral concerts rarely exceed 95dB (exception full brass) and 100dB levels are appropriate in terms of preservation of hearing during prolonged listening. Rock concerts often exceed these levels and these speakers are not recommended for the head bangers! It is because distortion is so low in the Quad ELS there is very little audible indication when approaching the maximum possible output. 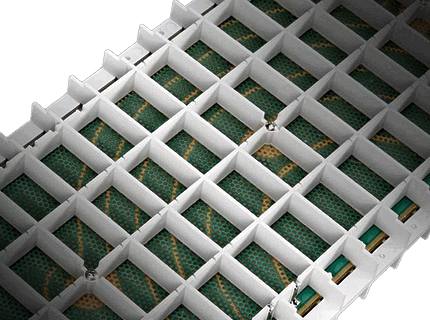 Three separate systems are used to protect from overload and arcing (which happens when the membrane touches the stators). With all the advantages of electrostatic speaker why are there not more companies producing them? The simple answer is they are very difficult to manufacture in general and to manufacture with consistency; the devil is in the details. The mylar film membrane needs to be at the correct tension and the conductive coating needs to be uniform. The latest models have a triple coating and more precise manufacture allows the maximum output to be reached with less chance of arcing. As in tube amplifiers, the step up transformer has to transform uniformly at all frequencies and have a linear transform function. The transformer and all the driver electronics and delay lines have been improved with very high quality components and the latest models are more reliable and less susceptible to adverse environmental conditions such as humidity. The latest equipment set up in IAGs new factory enables very high quality manufacture and the management is fully confident they have achieved a very high standard of quality control. Some electrostatics present a difficult load with impedances as low as 1 Ohm at high frequencies (the opposite to most conventional speakers.) The Quad ELS has a low impedance of 4 ohms and can be driven my most amplifiers of moderate power with good current output.